Green Roofs in the Press :: Living Roofs Inc. Welcome to what’s latest with Living Roofs—articles, events, and press features, with some special news updates sprinkled in. The green roof maintenance season is underway! Green roofs across the Southeast are greeting the spring temperatures with new growth and buds. Maintenance is one of the services we offer and is crucial to keeping your green roof performing and looking its best. We also provide rehabilitation strategies and services for green roofs that are underperforming or need a little TLC. Raleigh Rainwater Rewards Program will reimburse the cost of qualifying green roofs up to 90 percent. The amount of reimbursement is dependent on project location, available funding, and project cost. Reimbursements range from 75 to 90 percent of design and construction costs. The green roof was a small part of this incredible project and collaboration with the talented team over at Carlton-Edwards Architecture. In an effort to reduce energy output, a bill was introduced by three City Council Members that aims to mandate green roofs, solar power or wind turbines to be installed on new skyscrapers going up around New York City. Xero Flor America, LLC and Living Roofs, Inc team up with a talented team of architects and builders for a project in Durham, NC. We are seeking a skilled landscaper who has experience with plant installations and maintenance. Knowledge of irrigation installation is a plus. 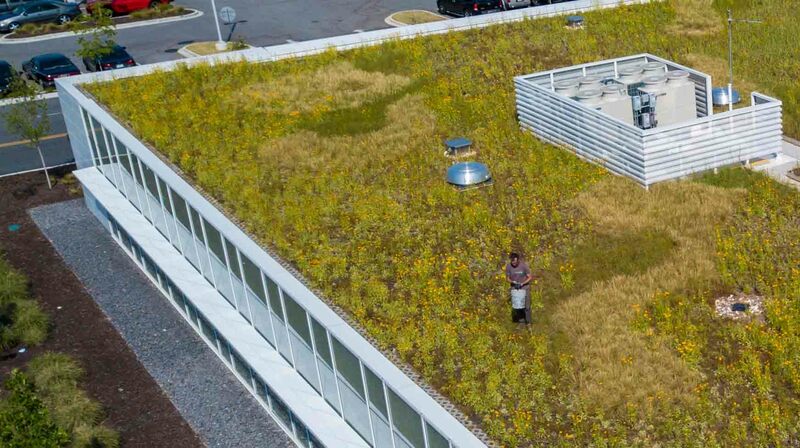 This position includes being part of our green roof installation team. No green roofing experience is necessary. We are based in Asheville, but we travel throughout the southeast installing and maintaining green roofs and living walls. You must be able to travel out of town (hotel and food per-diem provided). Travel is typically Monday–Friday but not every week. All travel will be in our work vehicles but you need to be able to reliably get to our shop in Asheville. Must have good driving record. Our work is physically demanding and often during hot conditions. We often work on construction sites and use large equipment (cranes, forklifts) operated by certified personnel. We are looking for honest, communicative team members who are self-motivated, punctual, and are willing to work as part of a team. References required. Pay rate will be based on skill level, experience and references. Hours will be 20-40 hrs per week with some off time in between projects. We are a drug and alcohol-free workplace. Mountain Xpress chats rooftop gardening with Living Roofs, Inc, local chefs and Bee City USA!